TAMPA, Fla., April 3, 2018 /Christian Newswire/ -- At age 90, Berei Brandenstein is the World's most senior fascia fitness expert. Rather than slowing down she's appearing in a series of T-Tapp videos demonstrating the newest techniques on how to get fascia fit. Fitness at any age is bone-deep. Here is a preview of her in the First Step ​Fascia Fitness workout - Preview of the T-Tapp First Step Fascia Fitness along with Teresa Tapp recently teaching ​Berei​ how to do Bone Density Lat Pulls for bone strength and heart health. Berei is an example of why the newest scientific trend in fitness is Fascia. The fascia system exists from head to toe without interruption as a woven structure covering every muscle, bone, nerve, artery, vein, organ and the spinal cord. This type of comprehensive, compound muscle and fascia activation during movement, will also optimize lymphatic circulation, improve brain-body function and correct muscle imbalance. Despite being on osteoporosis medication for over 25 years, not much progress was being made until Berei met Teresa. Berei began at age 73 doing 15 minutes of The Total Workout per day. Within 90 days she gained an inch in height and lost 21 inches all over her body and has continued to look and feel better each year by doing T-Tapp workouts. Her personal physician, Dr. Brent Agin believed that Tapp's method could continue to improve Berei's bone health to the point her condition might become classified as osteopenia instead of osteoporosis. Well, it happened! From age 86 to 88, ​Berei did 3-4 workouts per week and took an osteoporosis drug called "Forteo." During this time the only workout she did was "T-Tapp Senior Fit." At age 88 her Dexa scan verified an increase of 18.1% bone density in her lower spine (L1 - L4) along with 1% in the neck of her left hip joint. 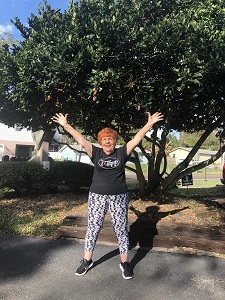 Then from age 88 to 90, Berei did First Step Fascia Fitness workouts 3-4 times each week but since she was unable to take any osteoporosis medication, Dr. Agin was concerned that she might lose some of the bone density she gained in her lower spine. Berei ​did​ maintain the 18.1% increase, her Dexa scan verified that her spine's bone density increased another 2.7% along with her left hip joint. Dr. Agin's official report has reclassified Berei's medical condition - at 90 years old Berei's spine is no longer classified as osteoporosis and her hip joint/femur has been downgraded to osteopenia. Berei also altered her eating habits by following "The God-Made, Man-Made Food Plan" as explained in chapter 6 of Fit and Fabulous in 15 Minutes. God-made foods is anything you can grow, pick, gather, milk, hunt or fish. Doing this 3 days a week gives her body a complete rest from processed foods and improves its ability to eliminate preservatives, decrease chemical calories and increase her body's metabolic process. "I felt the God Made Food plan and exercises from Teresa Tapp were heaven sent to help me recover my health" said Beri Brandenstein.